Disclaimer: This book was sent to me by the author, J. L. Pattison, for an honest review. Plot: On a rural Georgia farm in 1899, a lazy summer afternoon is interrupted by the arrival of a man claiming to be from the future. The stranger intended to provide the nation’s forefathers with a letter detailing future events that lead to the demise of America in the 21st Century, but ending up in the wrong place at the wrong time, he has no choice but to leave the letter with the farmer. Although no one ever believed the farmer’s story about the visitor, he’s afforded one last opportunity to recount the event with Theodore Garfield, a reporter for a local newspaper. But like everyone else, Theodore rejects the farmer’s story and dismisses the letter’s ominous warnings, including the prediction that America’s gradual collapse will begin with the murder of a future American president named John F. Kennedy. Years later, Theodore’s encounter with the farmer is all but forgotten until a young senator named Kennedy is elected president. With the old farmer and his letter now long gone, will Theodore Garfield be able to prevent one of the most tragic days in American history? Opinion: This is a wonderfully paced and written short story that surrounds the idea of what man might do if he was given a glimpse into the future. 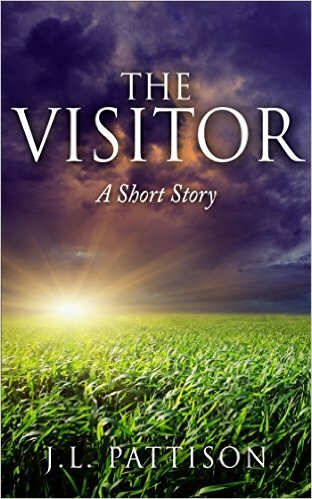 I am not huge on science fiction, and admittedly I do not read many short stories, but I found The Visitor rather entertaining and it left me with my mind reeling. I have found that if a story or book can keep you thinking after you have put it down, then there is something special to it. This short story starts out with a farmer named Leroy coming into contact with a man in his cornfield, who claims he was from the future. He explains to Leroy that he had attempted to go back in time to warn the founding fathers of the mistakes that would be made in America in the ongoing years, in an attempt to change history. Years later, Leroy attempts to convince a local reporter by the name of Theodore of the events that happened the day he met the stranger and that many events that were listed in the letter had come true. After Leroy passes the letter on to Theodore, who hardly believes the claims that Leroy has made, Theodore must decide what to do. We have all watched/read many works that deal with time travel and characters wanting to change events of history, but of course the main premise is always a variation of someone yelling “DON’T CHANGE THE PAST”. The idea of taking the standard Hollywood time travel plot and spinning it to make the reader think about the possibilities of how you can improve history is rather genius in its simplicity. Characters always want to change personal bad things that have happened or natural disasters, but it doesn’t seem like the focus is ever on changing history to improve mankind. I found this to be a new concept for this genre and actually left me pondering what I would change if I could go back and warn others. Overall, a very thoughtful and entertaining read. The writing and pace was perfect, there wasn’t too much speeding through the story and there were no points where it was being dragged on. I enjoyed that instead of the author blatantly writing into the story how many years had passed (ex: 25 YEARS LATER…), he tied the information into the story so it flowed easily and kept the reader on their toes. I found this very enjoyable and though provoking, you guys should give it a try! Sounds interesting. I am going to check this one out. I hope you enjoy it, thanks for reading!! If you do get around to checking it out (it’s only 7,000 words) I’d love to know what you think of it, especially in light of other indie publishers of the same genre. Thank you for reviewing The Visitor. I am glad you enjoyed it and I appreciate your kind words.